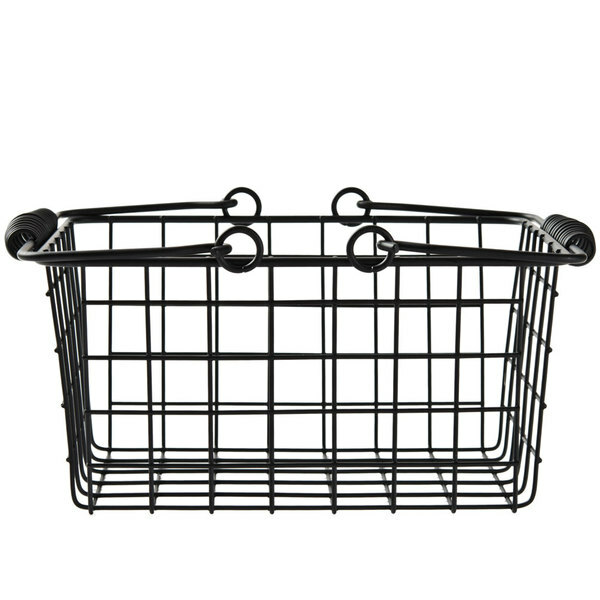 American Metalcraft RBHB975 Black Tabletop Market Basket - 9" x 7" x 5"
Choice Black Tabletop Market Basket - 9" x 7" x 5"
American Metalcraft RBHC759 Chrome Tabletop Market Basket - 9" x 7" x 5"
This American Metalcraft RBHB975 9" x 7" black basket is great for holding tabletop condiments and napkins. With a double handled design that mimics the look of plastic market baskets, this basket is great for adding a simple, rustic look to your table. 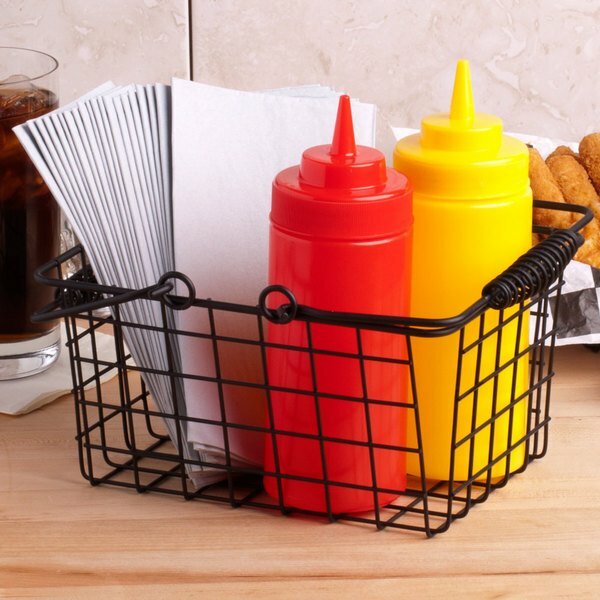 You can fill the basket with napkins, condiments bottles, and even menus so you customers have everything they need right at their fingertips. Refilling the condiments is a breeze thanks to the market basket's hinged handles. 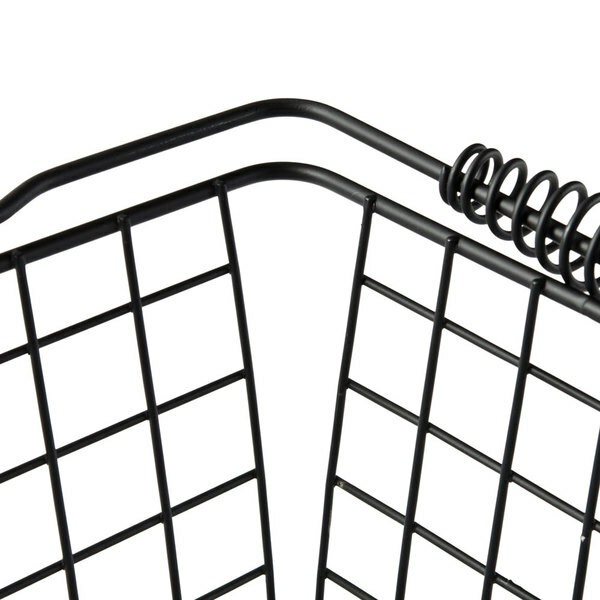 The two handles ensure that the basket remains balanced during transport, even when unevenly loaded. 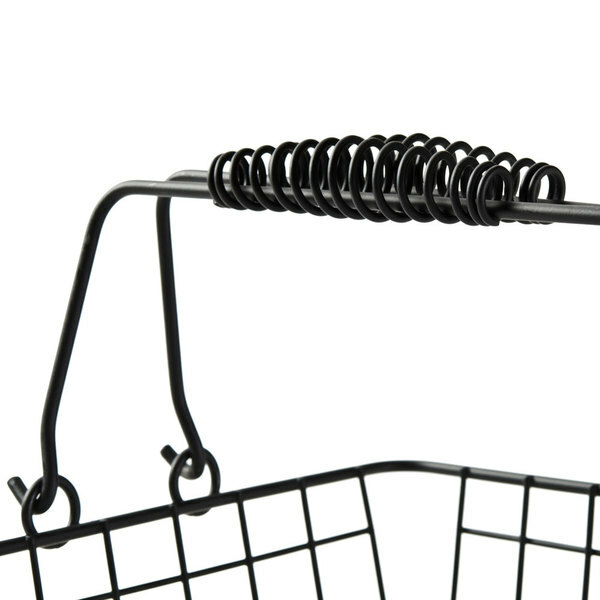 With a sleek black metal construction, this market basket is great addition to any bar, diner, or restaurant. 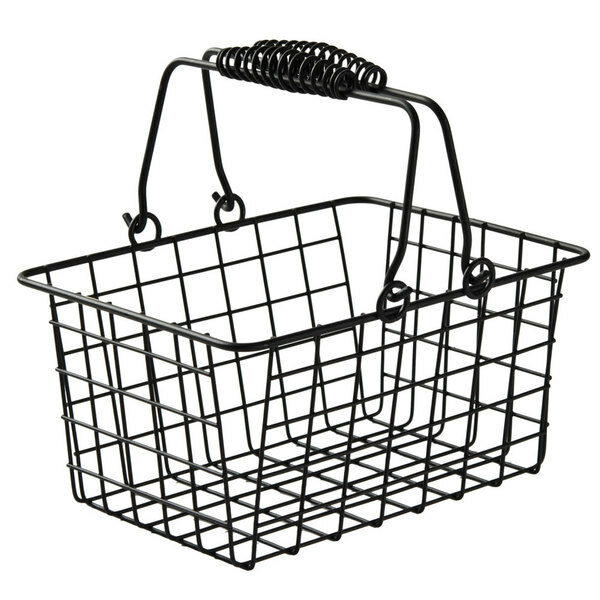 Overall User Rating: American Metalcraft RBHB975 Black Tabletop Market Basket - 9" x 7" x 5"
American metal craft has an endless supply of products, always finding something new, i use these baskets as caddy's on the table and for napkins on catered events. 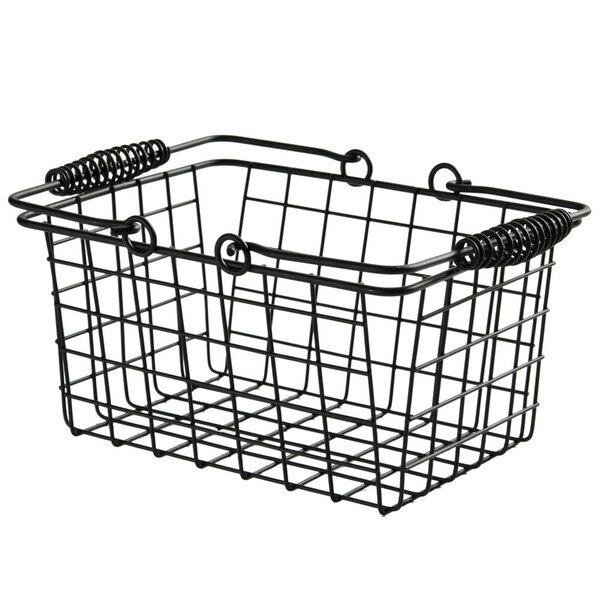 Baskets are high quality and very sturdy. We use the baskets to display our soaps and bath fizzies in retail locations. They add a rustic look to the displays. Loved these baskets! They look great on our tables and go wonderful with the decor. Good size for sugar caddies, salt and pepper, and ketchup. 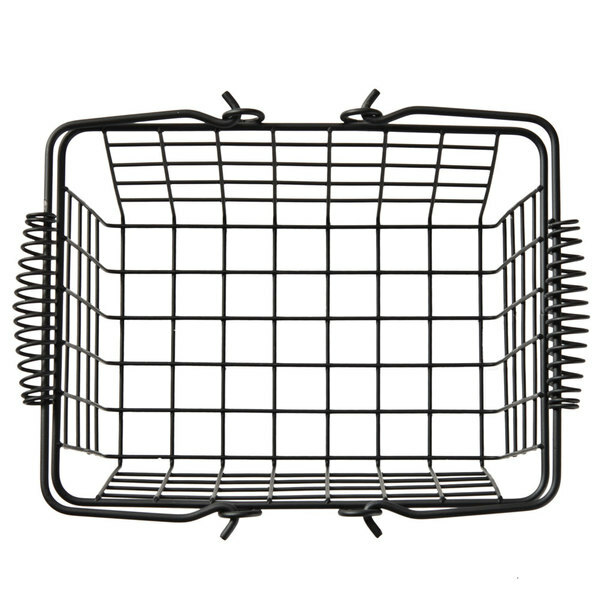 The Black Tabletop Market Basket is really useful on buffet table holding, as condiment holder at the table, and also in the pantry to corral small packets. 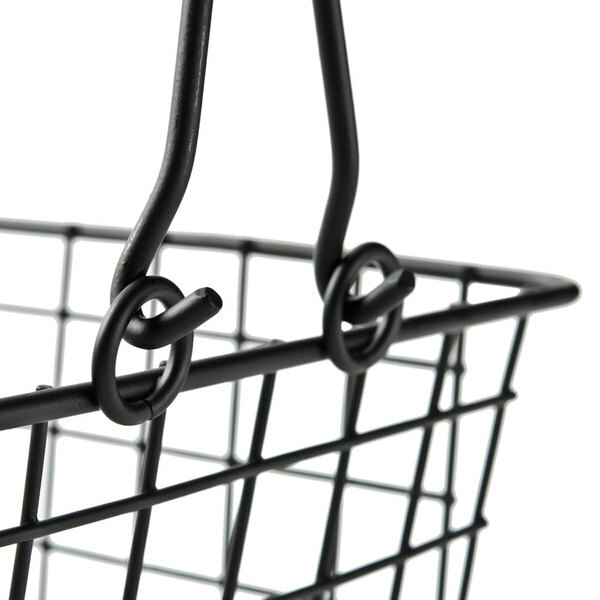 Very nice black tabletop market baskets. Easy to clean and to refill. I would highly recommend to anyone looking for a basket to move stuff around. 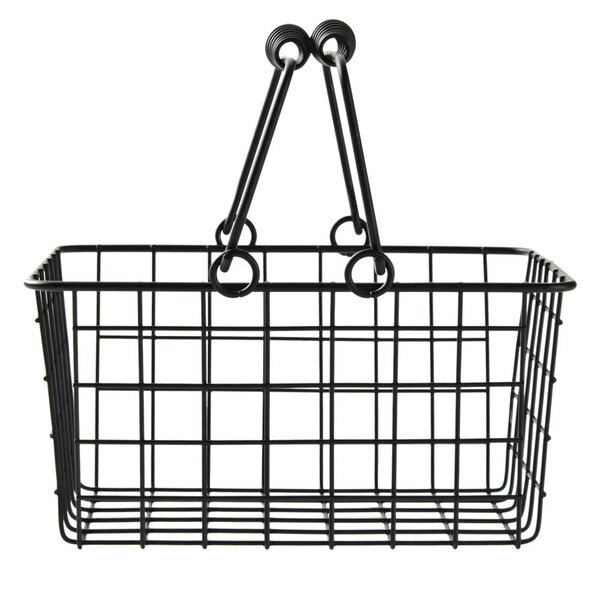 The American Metalcraft RBHB975 Black Tabletop Market Basket is a great product. The quality is very good and the price is reasonable. I am using it for napkins right now but the possibilities are endless! Very good quality. Love that this has handles and can be moved around. Very cute for serving bread, storing fruit (I wouldn't store softer fruit for fear of getting mushed by the lines)...I actually keep dish towels in here for now, until I figure out a better use. Was just too pretty not to buy! I love this basket. It's great for displaying squeeze bottles full of condiments of course but I've found it more useful next to our coffee maker as a k-cup holder. And it's very cute! Cute, sturdy and versatile...like me! No, ok, really, these are cool. We use them for condiment caddies on our food truck so they see a lot of rough use and frequent washing and they've held up great. Well made product, haven't seen any chipping or rust at all. We ordered these on a whim for wedding decor. I used them for individual bread baskets on each table. The guests loved them. I am now going to use them as gift baskets. These are okay. Too deep to use for our purposes, but that's not the product's fault. They still seem too big for a tabletop basket. Super cute basket. I like to use mine to hold yarn and hooks while crocheting. It is strong and durable. It also comes in another color I will be buying soon. I use this to keep like items together in my pantry, bags of different seed packets grouped together, condiments grouped together, different vinegars . also use to make a welcome basket for guest, rolled up hand towels, fancy soaps, toothpaste in pretty basket. Will find a use in every room in the house! These are a great value and product. 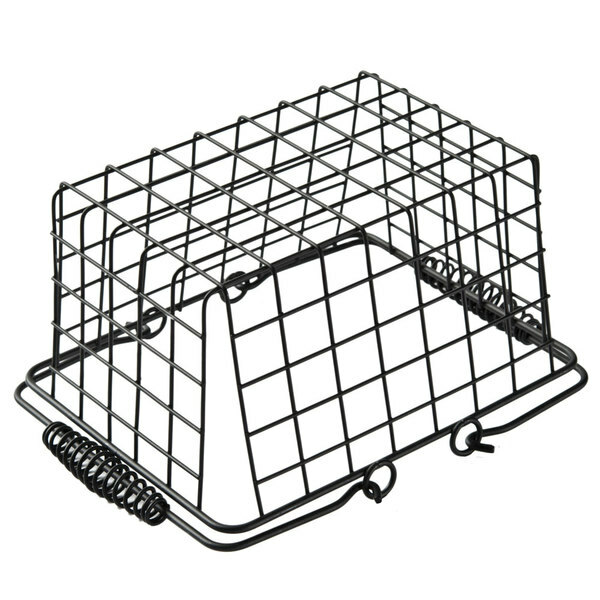 Using the baskets for different organization in the office and kitchen. Will buy more when there is a need. These are perfect for my tabletop service! Very sturdy, big enough for lots of items to be held in place, and keeps everything handy for my customers when they order a sandwich. Have been looking for something like this for the past 3 months and these fit the task perfectly!